Winter fishing can be more fun than most anglers realize, but in a kayak or other paddlecraft, precautions are necessary. One of the best-kept secrets in the angling community is fishing during the winter. 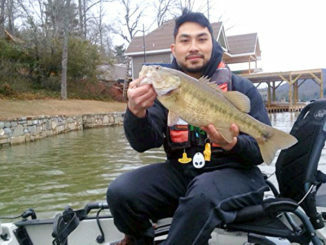 It might not exactly be a secret, but a large contingent of anglers hits the water sometime in March just before the spring spawn, fishes through the spring and early summer, then starts to peter out once the weather gets hot. The same anglers may fish a time or two in the fall, but most never consider winter fishing. While kayak anglers are but a subset of the fishing community, the same mindset often holds true, maybe even to a greater extent because kayak fishing almost always involves getting wet to some degree, simply due to paddle splash and the close proximity to the water.ne of the best-kept secrets in the angling community is fishing during the winter. It might not exactly be a secret, but a large contingent of anglers hits the water sometime in March just before the spring spawn, fishes through the spring and early summer, then starts to peter out once the weather gets hot. The same anglers may fish a time or two in the fall, but most never consider winter fishing. The secret is that winter can provide some of the year’s best fishing. Food is harder to come by, so some species bite more readily. Others may actually prefer cooler water and become more active. The No. 1 and No. 2 considerations when kayak fishing in the winter are attire and safety, and the first has a lot to do with the second. Just like riding a motorcycle in cold weather, learning what to wear and how to dress negates much of the adversity, while reserving much of the enjoyment for yourself. 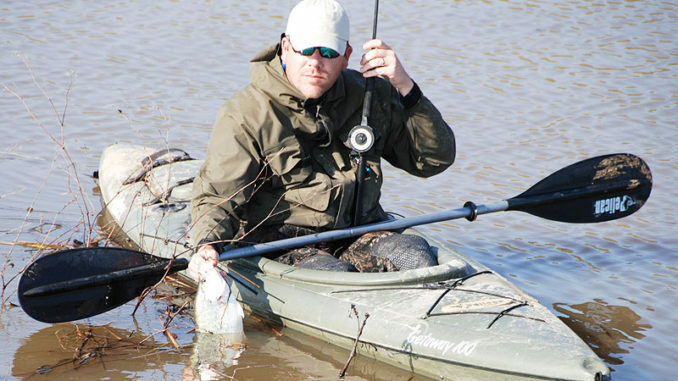 For kayak fishing in the Carolinas, where the temperature — for the most part — stays above freezing during the day, anglers who dress in layers can stay warm and dry on the water. Dressing for winter fishing is done in three layers. The first is the base layer next to the skin. Its purpose is to cover the skin for comfort, while allowing perspiration to wick through so moisture won’t accumulate under your clothing. Base layers are mostly thin synthetics or wools. A word about cotton here. Cotton might be warm, but it absorbs water and should be avoided. The second layer is the middle or insulating layer. These garments are made of denser, thicker synthetics, fleece, wool or down. This layer traps air that is warmed. During mid-day, this layer may actually be the outer layer if conditions permit. The final layer is outerwear, which needs to be both windproof and water-proof. Outer garments will vary for fishing on a mid-50s day and a lower-30s day. Rain-shell materials works for average days while dry suits have become very popular for harsher days. A final note about preparation for being on the water in the winter: safety practices deserve the same preparation as fishing and launching plans. PFDs are a must; there’s no exception in the winter. Additional clothing stored in a dry box or bag is also necessary in the event of a winter spill. Lastly, always file a float plan, or better, fish with a partner who can provide help if needed. Justin Carter of Mount Pleasant, S.C., a member of Hobie’s pro staff, tells the story of a fishing trip that almost ended in tragedy. It was early in Carter’s kayak-fishing career; he was learning how to stand up in his Hobie Adventure, a much-narrower craft than his current Pro Angler. 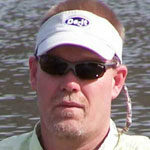 He and a buddy were sight-fishing the flats off the ICW and had paddled a couple of miles to find fish. Carter said that all of the sudden, he got that left/right wobble going, a tell-tale sign he was about to go in the water. No one wants to go in the water during the winter, the cold air and water that day were more serious, even life-threatening, considering the other situation Carter had put himself in. Carter said the incident taught him a lesson. To this day, he always packs spare clothes and a towel in a dry bag that goes in the boat. In addition, he never goes out on the water without some type of communication. HOW — Yellow perch spawn very early in the season, so mid- to late January is prime prespawn time on many western North Carolina lakes. Live minnows are hard to beat fished around rocky points, as well as small crawfish-colored crankbaits. LAUNCH — Nantahala Lake has two public-access points, one on the east side of the lake at Rocky Branch and the other on the west side at Choga access. Both can be reached via Wayaha Road. INSIDER TIP — Nantahala Lake is best known for its population of kokanee salmon. These fish often frequent the same spots as yellow perch. HOW — Redfish will be schooled up tight and holding in extremely shallow water to avoid predation by dolphin. Cast small-plastic baits out in front of the schools. LAUNCH — Kayak access to Copahee Sound is from the public ramp located at off Gadsonville Road east of US 17.
INSIDER TIP — Most anglers think of winter fishing for reds as sight-fishing, which requires clear water. Winter weather frequently causes murky water conditions, so always fish with scented or scent-enhanced baits.